Opis: History of Warren, Massachusetts (Classic Reprint) - Darling Olney I.
Excerpt from History of Warren, Massachusetts<br><br>In presenting this work to the public, the author would indulge in a few introductory remarks:<br><br>History, to be entertaining and useful, should be reliable; and while infallibility is not claimed for this production, it is hoped no deviations from the line of historical fact may be discovered. The material has been collected by personal observation, conversation with the oldest residents in town, correspondence with parties who formerly lived in Warren, and by careful examination of the town and church records.<br><br>The writer would here express his gratitude to Mr. S. E. Blair for aid kindly and politely furnished. Also to John Moore, E. F. Strickland, Alvin Copeland, and to all others who have, in any manner, assisted him in his labors.<br><br>If the perusal of this book shall be the means of moving the people of Warren to a greater interest in their local history and surroundings, the writer will feel amply rewarded.<br><br>About the Publisher<br><br>Forgotten Books publishes hundreds of thousands of rare and classic books. Find more at www.forgottenbooks.com<br><br>This book is a reproduction of an important historical work. Forgotten Books uses state-of-the-art technology to digitally reconstruct the work, preserving the original format whilst repairing imperfections present in the aged copy. In rare cases, an imperfection in the original, such as a blemish or missing page, may be replicated in our edition. We do, however, repair the vast majority of imperfections successfully; any imperfections that remain are intentionally left to preserve the state of such historical works. 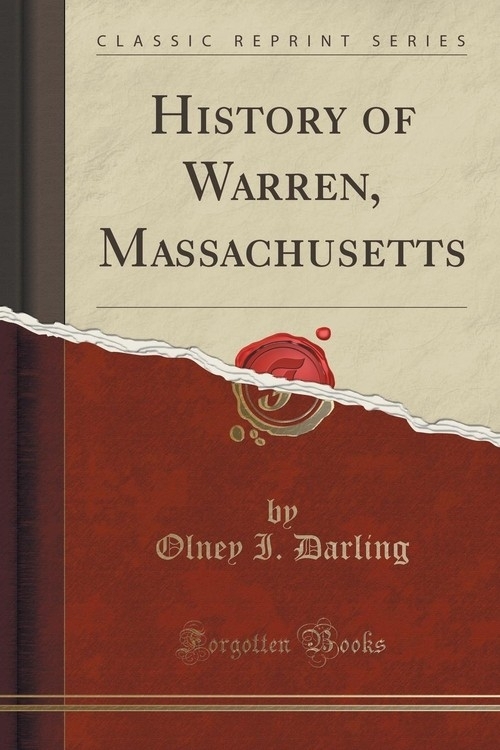 Szczegóły: History of Warren, Massachusetts (Classic Reprint) - Darling Olney I.
Recenzje: History of Warren, Massachusetts (Classic Reprint) - Darling Olney I.